Trailing 2-1 in the Stanley Cup Finals, the Golden Knights must find a way to solve the Washington Capitals' defense in Game 4 Monday night at Capital One Arena. "It's been said all year," Vegas forward James Neal told the Las Vegas Sun. "We know what we have in this room and we stick together. We got each other, we'll pick each other up, focus on the next one. We'll have our best game of the year and tie it up." The Golden Knights rallied from a 1-0 deficit in the Western Conference Finals to win four straight games. They have lost consecutive games for the first time in the playoffs and showed no signs of solving Washington's smothering defense during Saturday's 3-1 Game 3 loss. Vegas was limited to 22 shots on goal, its second lowest total in the playoffs. The Golden Knights attempted 62 shots. Braden Holtby made 21 saves and his teammates blocked 26 shots. "Offensive teams have certain tendencies, certain routes that they take through the neutral zone, plays they like to make," Capitals defenseman Matt Niskanen told NHL.com. "So if you can be on top of them, turn over some pucks, stifle them, make it hard for them to gain entry with possession, that frustrates skilled players." The Knights have managed just three goals in the last two games. Washington's forecheck has disrupted the Vegas offense and forced turnovers like the one that led to Devante Smith-Pelly's game-clinching tally on Saturday. Washington has also been quick to turn broken Vegas plays into rushes. 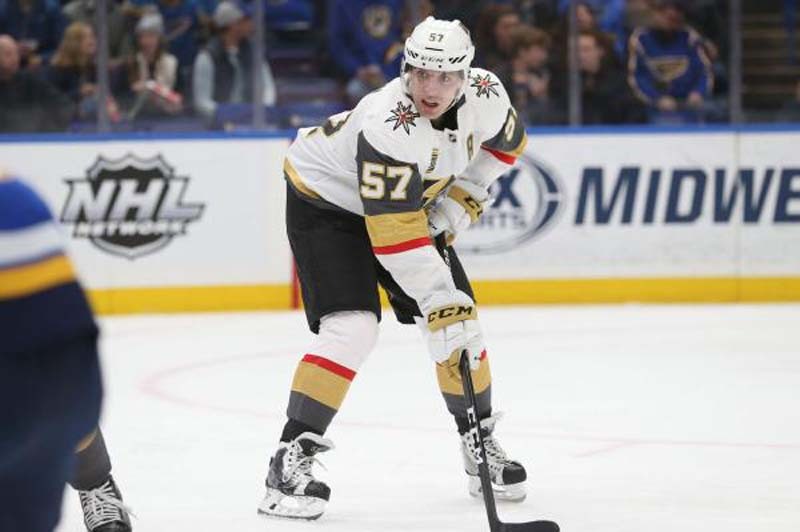 "I think we can hang onto pucks more instead of putting it in the slot blindly," Vegas forward David Perron told NHL.com. "I think our line's been guilty, for sure, of throwing some pucks in the slot that don't result in anything other than transition for their team." The Capitals, playing their first home Finals game since Detroit completed a sweep in 1998, improved to 11-4 in the playoffs when scoring first as Alex Ovechkin's goal made it 1-0. It was his 14th of the playoffs and tied John Druce's 28-year-old franchise record. Center Evgeny Kuznetsov, who left Game 2 with an upper body injury, did return for Game 3 and provided a goal and an assist. In the first Stanley Cup Final of his storied career, Ovechkin is playing complete hockey: scoring goals, blocking shots and fighting for loose pucks. "It's the Stanley Cup final," Ovechkin told the Washington Post. "What do you want to do? It's all in for everybody." Added defenseman John Carlson: "He's as engaged as anyone could ever be, I think. It shows in his game. And it shows in the effect it has on the rest of us." It is up to Vegas coach Gerard Gallant to find a way to stop Ovechkin and Co. and generate more good chances against Holtby. "In the three games, we haven't been good enough," Gallant told NHL.com on Sunday. "If we don't step up our game, the same result is going to happen tomorrow night. So, we'll see what we're made of."